Hayao Miyazaki's "Castle in the Sky" is more accessible to younger audiences than the mystical "Spirited Away." 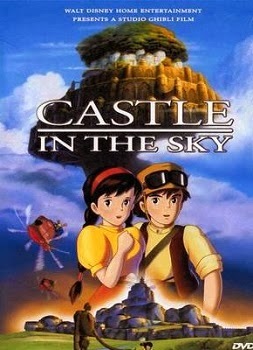 While I felt "Spirited Away" was a superior film, I found "Castle in the Sky" to be more exciting and enjoyable. "Castle in the Sky" is a dazzling homage to the adventure comics of the 1920s and 30s such as "Terry and the Pirates" and "Little Nemo." This isn't to say that "Castle in the Sky" doesn't have its own mystical and spiritual qualities, it does. However, "Castle in the Sky" will keep you enthralled with its action-packed sequences and brilliant animation. Sheeta (Anna Paquin), a young girl is being transported in a giant airship by mysterious Muska (Mark Hamill) when they are attacked by a band of sky pirates lead by Dora (Cloris Leachman). Sheeta falls from the airship but does not die. Sheeta mysteriously floats to the ground. There she meets a boy her own age named Pazu (James Van Der Beek). Pazu is enthralled by Sheeta. Pazu's father had a love of aviation that he passed on to his son. Pazu's father spent his life looking for a mythical island in the sky called Laputa. In fact, Pazu's father once saw the castle in the sky. In short order, Dora's pirates are on the ground and in pursuit of Sheeta. Sheeta and Pazu escape by train, when they run into the Army. Turns out, the army wants Sheeta too! Sheeta and Pazu escape by floating to safety when the train-bridge collapses. Sheeta does not know just who she is or why so many want to capture her. So begins one of the most original adventure films you will ever see. "Castle in the Sky" boasts some of the most beautiful animation ever drawn. If your idea of Anime is "Pokemon" and "Speed Racer" then I challenge you to get another perspective. Miyazaki is an artistic genius. "Castle in the Sky" is filled with wondrous machines and lands. I was reminded at times of the 70s cult classic "Fantastic Planet." This would be an excellent film to loss your "anime virginity" to. This transfer is outstanding. No shimmering, pixilation or delineation problems. Crisp, clean and strongly drawn lines. The images in "Castle in the Sky" are vivid, imaginative and full of incredible detail. I loved the various airships. If you are an aviation buff, this movie will take you back to your fondest childhood imaginings. "Castle in the Sky" will make your home sound system sweat from the workout it gives. Excellent balance between the ranges. Full, rich tonal quality. The numerous battle sequences will rock your speaker system. The lilting music during the film's quieter moments can be heard in all of their subtle beauty. Simple, graceful design which makes great use of the images and music from the movie. Easy to navigate. No Easter Eggs found. Disk 2 is taken up completely by the full storyboard version of the movie. You can watch it in either Japanese or English. Animation fans will enjoy seeing the detail in this stripped down version of the movie. The movie is a combination of still storyboard frames and a preliminary animation. The bulk of the 2 hour 5 minute running time is animated. The storyboard version is put together with the soundtracks. "Behind the Microphone" is a featurette about the dubbing of the English version. The featurette includes interviews with Mandy Patinkin, Mark Hamill, Cloris Leachman and James Van Der Beek. There are about 10-minutes of original Japanese trailers. The main feature is introduced by Disney's John Lassiter. It gives you a small preview of what you are going to see and an introduction to director Hayao Miyazaki. This is a "must have" DVD. "Castle in the Sky" will be enjoyed by all age groups. The colorful and original animation by Hayao Miyazaki will sweep you up into a delicious world of mystery and imagination.